Ford’s clever adaptive steering is worth the nod for shoppers. If you tow often with your Super Duty (and you should) opting for the nifty camera system is a must-have. One year removed from a complete redesign means Ford isn’t tinkering with the Super Duty’s formula. It’s the same truck as last year, offered in XL, XLT, Lariat, King Ranch, and Platinum trims. 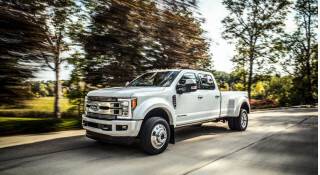 XL and XLT trucks are the ones you’re likely to see parked at job sites, Lariat trucks will likely be parked in driveways, and King Ranch and Platinum versions of the Super Duty will be back at job sites, just in the foreman’s space. Two engines in numerous powertrain configurations offer payload, towing, high mileage, or comfort configurations that can suit any shopper. The Reader's Digest version? The new 6.7-liter turbodiesel is the towing and long-hauling champ, the carryover 6.2-liter V-8 is king of payload and affordability. Choose wisely; a fully loaded Super Duty can cost just as much as a luxury car—they feel like one too. The new Ford Super Duty won’t be mistaken for anything other than a truck, but it’s handsome and functional. What more do you need? The 2018 Ford Super Duty dials down some of the macho moves from older trucks—maybe. Chromed power bars running along the grille are now bookended by C-shaped headlights, and a “Super Duty” stamped into the hood that’s subtle like an air-raid siren. Smarter creases in the sheet metal down the sides and in back, regular door handles, and subtle exterior cues bring back to earth the big Ford truck that started to look comically butch just a few years ago. A lot of the new Super Duty’s flavor can be traced back to the F-150, with which it now shares a cab and other styling cues. The new look is most pronounced in double-cab configuration, which is more cohesive than before. The second row no longer looks like a brick sandwiched between the bed and the body. Inside, the Ford Super Duty eschews style for substance, although it can look luxurious in higher trims. Most trucks will be built for work, and shod with vinyl everywhere. It’s a utilitarian approach to styling, and it mostly works. It doesn’t have the understated style of higher-trim trucks made by GM, or the outre cowboy look of some Ram models, but the Ford strikes its own balance of comfort and flair. Big and brawny like a linebacker, the Ford Super Duty can be just as nimble as a dancer with its new steering setup. The 2018 Ford Super Duty is available with two engines, both V-8s, mated to 6-speed automatic transmissions. Rear-drive is standard, and four-wheel drive is available on all models. 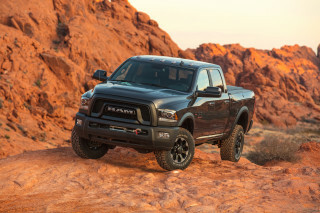 The standard engine is a carryover 6.2-liter V-8 that makes 385 horsepower and 430 pound-feet of torque that’s rated to carry up to 7,680 pounds in the bed. Of course, it wouldn’t be a heavy-duty pickup without some kind of unimaginable claim that the new Super Duty could tow a small planet. For those kinds of superlatives, shoppers will need to opt for a 6.7-liter turbodiesel V-8 that makes 440 hp and 925 lb-ft of torque. Mated to a 6-speed automatic (no relation to the 6-speed in the gas version) diesel-powered pickups can tow up to 32,000 pounds. A few words on those head-spinning figures. 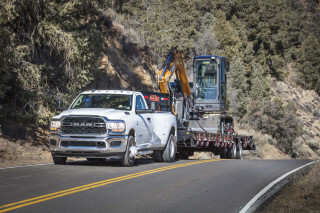 Maxing out the Super Duty’s tow ratings requires a commercial driver’s license, and all 925 lb-ft of twist doesn’t come on right away—the transmission would pack up and walk off the job if it did. Available in single- or dual-rear-wheel configurations on F-350 and higher, the Ford Super Duty is admirably equipped with enough grunt for most jobsites. The Ford Super Duty uses a fully boxed, ladder frame underneath that has been stiffened up to 24 times more than the last generation pickup. New front radius arms help smother the road, and a revised rear suspension keeps babbling at bay in the back—even without a load on. The Super Duty makes available a variable ratio steering setup that can speed or slow the steering rack at speeds to make the truck more maneuverable at low speeds, or less jittery at high speeds. It’s a great setup that could help fight fatigue for workers who continually use their trucks to negotiate tight spaces. Top trims are downright luxurious, but every Ford Super Duty model can carry passengers and cargo without breaking a sweat—they’re trucks after all. 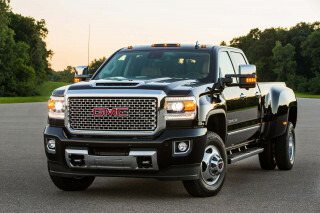 If it’s been a minute since you’ve been in a full-size truck, please have a seat before you hear the following: Trucks are nicer places to be than many luxury cars. You’ll pay dearly for the privilege, but a Ford Super Duty Platinum can go toe-to-toe with 75 percent of what’s on a luxury car lot and still look good. Top trims like the Ford Super Duty King Ranch get a ranch-full of hides on the seats and dash. The seats can be upgraded to multi-contour affairs with in-seat massagers—ideal if the truck serves as a mobile office. Lower trims still get durable cloth and scratch-resistant plastics that feel up to the task of thankless daily duty. Smartly, Ford offers vinyl flooring on all trucks—even Platinum models—so workmen and foremen won’t worry about grinding dirt into luscious carpet with their boots. 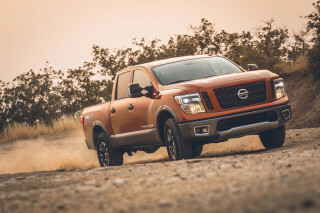 Double cab models have enough room for 6-footers to sit behind other 6-footers, but extended cab models may not be ideal for four adults on long trips. 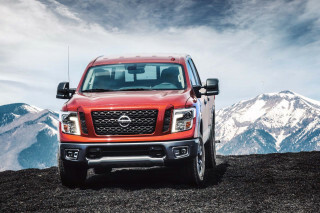 All four-door trucks have a nifty folding rear seat for better in-cab storage, and all trucks offer plenty of interior cargo capacity with deep, wide center consoles. The Ford Super Duty is available with two bed lengths: 6-foot-9 and 8-foot. The latter is required for a long distance fuel tank that can extend the range of a Super Duty up to 1,000 miles, according to Ford. Bigger isn’t better, but a lack of official data keeps us from scoring the Ford Super Duty for safety. Official safety data isn’t complete, and we’re not expecting that to change any time soon. Federal regulators have tested versions of the Super Duty, including rear- and four-wheel drive F-250 models. Those earned mixed scores, including a four-star overall rating and worrying three-star rollover crash protection score for 4WD F-250 models. Bigger isn’t always safer. The new Super Duty incorporates many active safety features found on smaller cars these days, but stops short of offering automatic emergency braking. Blind-spot monitors, forward collision warnings, lane departure warning, and adaptive cruise control are all here, which should make longer trips more comfortable. Base trucks are very bare, but the Ford Super Duty gets comfortable quick. 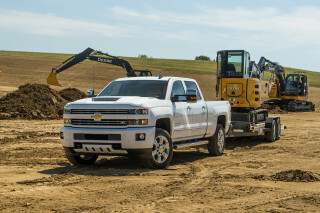 Take your time with the order sheet, there are countless ways to configure a truck. The Ford Super Duty is a rolling contradiction. Its muscle is equaled only by its intellect, which may take some shoppers by surprise. It’s remarkably high-tech for a work machine and can be a draft horse with a doctorate. There are millions of possible combinations for the Ford Super Duty range; far too many to list here. Our condensed version can give shoppers a place to start, but we suggest an order guide and adequate hydration before starting to configure their trucks—it’s going to take a while. With three cab configurations, two bed options, two powertrain choices, and at least seven rear axle ratios, the customization options can be dizzying. The Super Duty range is split into work-ready grades: XL and XLT; and passenger-focused trucks: Lariat, King Ranch, and Platinum trims. XL models can be stripped of nearly every convenience including power windows, locks, mirrors, and a CD player. Were you expecting Bluetooth? XLT models put several of those features back in, including power accessories, cloth seats, a rearview camera, a basic infotainment setup with LCD screen. 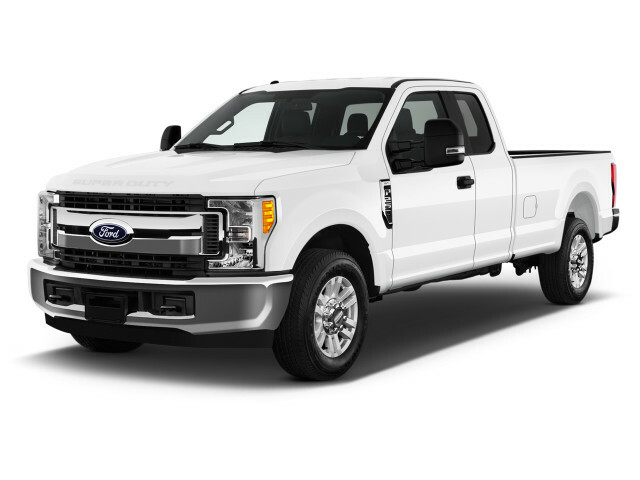 Lariat models look like daily drivers with leather upholstery, an 8.0-inch touchscreen for infotainment, power-adjustable pedals, an 8.0-inch driver information display, and 18-inch alloy wheels. King Ranch models heap on amenities such as heated and cooled front seats, unique leather upholstery, dual-zone automatic climate control, and premium audio. King Ranch models offer their own unique look and can be optioned to the hilt with creature comforts you might find in luxury cars. Platinum models go all the way too, but without the same Western themes that King Ranch models embody. Power running boards and available 20-inch wheels just add to the Platinum’s (sizable) curb appeal. A top-of-the-line F-450 Platinum model can crest $80,000 without breaking much of a sweat. There are two things we can’t live without, if it were our money. Last year, Ford made available an adaptive ratio steering setup that could speed up or slow down the power steering assist based on vehicle speed. It’s a clever system that uses an electric motor and collar on the rack to speed up input to make maneuvering easier at slow speeds, or slow down input at higher speeds to reduce sawing on long trips. It’s a common-sense addition that deserves a look from shoppers. And up to seven cameras placed around the Super Duty can sashay the truck into a perfect gooseneck trailer pose or into a tight parking spot. It’s the latter feature that we say is a “killer app” because towing just won’t be the same for owners after the Super Duty is done with it. Like it or not, heavy duty trucks don’t report to the EPA. Frankly speaking: That’s baloney. 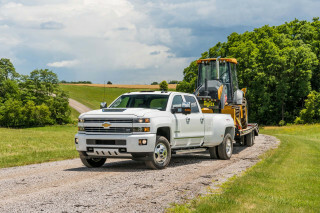 Some Super Duty buyers are replacing family vehicles with these trucks, and they’re clearly being used for other things besides heavy-duty work. Protests aside, Ford claims a long-range tank and diesel combo can cruise on a highway for up to 1,000 miles. Our napkin math leads us to believe that the very best mileage you might see in a Super Duty is 20 mpg highway, which isn’t terrible. one tuff truck. and a joy to drive. the only problem i have with this truck is that its to tall, i cant reach into the pickup box to grab a tool. 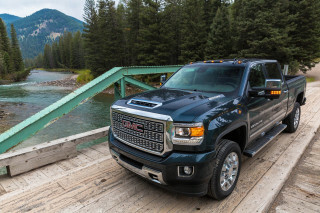 bring it back down to the hight of the 2015 pickup. otherwise its a great truck.